Mattogno seems to be especially happy that the number of unburned corpses still lying in the Belzec mass graves is, in his opinion, very low. In familiar "Revisionist" manner he links a conspiracy theory to this, hinting – under the complete misconception of the nature and purpose of the investigation conducted by Prof. Kola that was exposed in Part 1 of this commentary – that Kola may have failed to carry out an opening of the mass graves and exhumation of the corpses because he feared discoveries contrary to what Mattogno calls the "official historical version". As we have seen above, A. Kola asserts that ten graves (# 1, 3, 4, 10, 13, 20, 25, 27, 28, 32) were “filled with bodies in wax-fat transformation,” but then hastens to add that they were located “in bottom parts of the ditches, as a rule,” which means that these graves were not, in fact, ‘filled’ with corpses in a state of saponification. What is the basis of this estimate? Obviously nothing but the volume of the graves and the thickness of the layer of corpses, but, as we shall see, Tregenza’s estimate is decisively disproved by the actual results of the Polish field work. On April 13, 1943, on the basis of information from the local population, the Germans discovered seven graves containing a total of 4,143 corpses of Polish soldiers in the forest of Katyn. Between April and June, the bodies were examined by a commission consisting of physicians from twelve European countries, by a commission of the Polish Red Cross, and by U.S., British, and Canadian officers who were prisoners of war. The Germans then published an official report with the forensic medical findings of the investigation, containing 80 photographs and the names of the victims identified.234 The Vinnytsya massacres were discovered by the Germans in the beginning of June 1943. Ninety-seven mass graves were found in three different locations, containing the bodies of 9,432 Ukrainians murdered by the Soviets. Between June 24 and August 25 no fewer than 14 commissions, 6 of them composed of foreigners, visited the mass graves. 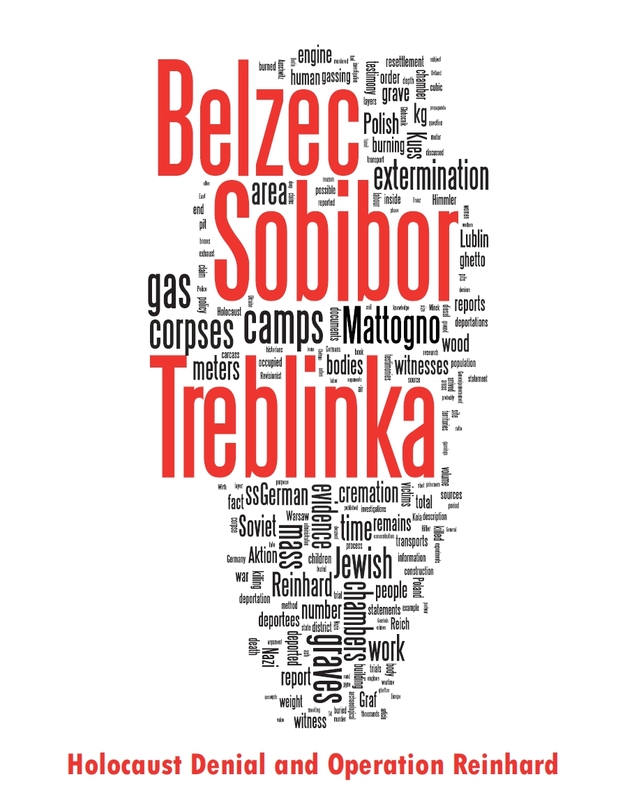 Again, the Germans collected the results of their findings in a substantial publication: 282 pages with 151 photographs, with forensic medical reports, and victims’ names.235 Why, then, were the corpses of the mass graves at Belzec not exhumed? The answer is implied in the analyses of the probes taken out during the drillings. 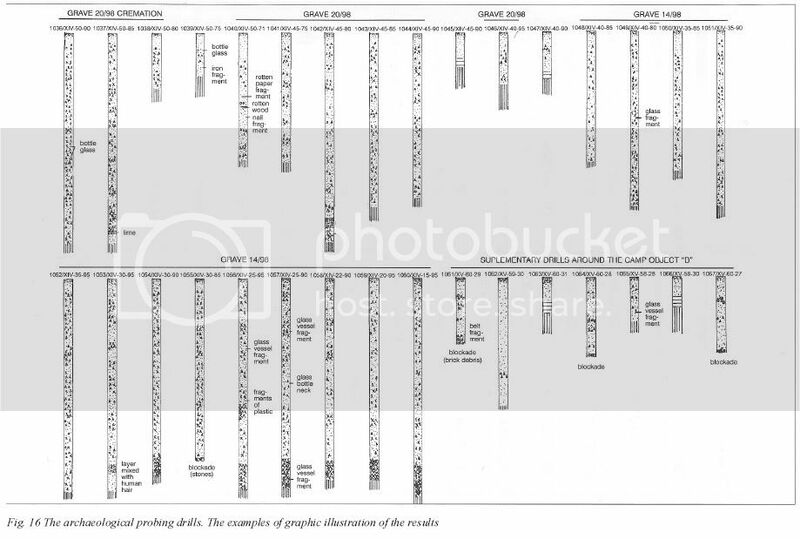 In fact, Andrzej Kola publishes the results of 137 samples – obviously the most significant ones of the 236 samples taken altogether – but out of these only two (482/XV-30-60 and 486/XV-25-50) bear the explicit designation “human corpses.”236 The symbol designating “human bones and wax-fat mass” – a kind of stylized double X – appears, in addition to the samples just mentioned, only on four more samples (485/XV-30-50, grave 10, 286/XVI-90-40 and 332/XVI-85-40, grave 3, and finally 1042/XIV-45-80, grave 20).237 The thickest layer is the one belonging to sample 332/XV-85-40 (described as “tooth/human hair/water/human hair”), which corresponds to approximately 15% of the depth of the grave ( = 5 meters), thus to about 0.75 meters. Kola further mentions the discovery of corpses in a layer 1 meter thick in grave 27,238 but without providing a visual representation of the location of the 4 drillings carried out in this location. In any case, the order of magnitude does not change. mean, apart from any extrapolations? It means simply that the drill, which had a diameter of 65 millimeters (2.5 inches), went like a lance five times through the remains of three or four bodies; in other words, in concrete terms, Kola has discovered 15 or 20 corpses. Therefore, the only legitimate conclusion one can draw from these samples is that the graves mentioned contained only rare corpses here and there. Nonetheless, Kola’s book contains a rich photographic documentation of objects found in the area of the camp during the project work. A full 37 color photographs show the most insignificant junk: horseshoes, keys and padlocks, earthenware pots and rusty scissors, pieces of glass and of china, broken combs, glass bottles, coins etc., etc. – but not a single photograph shows a corpse or part of a corpse! On the other hand, given the small number of drillings, one cannot exclude the presence of other layers of corpses near those identified by Kola; this is even probable. 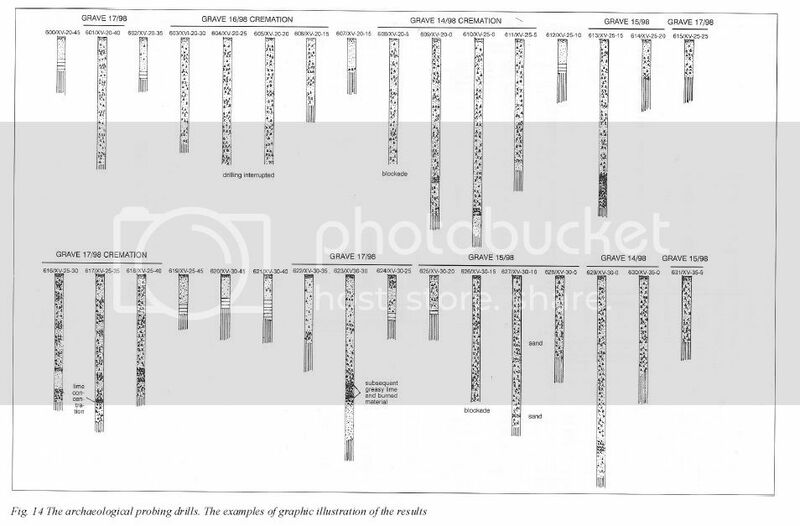 In fact, when one examines the positions of the three samples in grave 10 that indicated the presence of the corpses in a state of saponification, they are found to be concentrated in two small areas at lower left240 of samples 485 to 486 and near 483. This may indicate that originally there were two small graves of 40 to 50 square meters with several layers of corpses at the bottom. The same might be true for samples 286 and 332 of grave 3, which are next to each other within the standard distance of 5 meters along the south-north diagonal of the grave,241 and for sample 1042 of grave 20. One may conclude that the most probable interpretation is that the graves contained at most several hundred corpses. It was situated towards the west of the grave No 12, also on the border of ha IX and XV. One of the concrete ever-burning fires from the 60s is placed over it. The burial place was estimated on the base of 9 deep drills (No 562-564, 577, 578, 580, 582, 585). 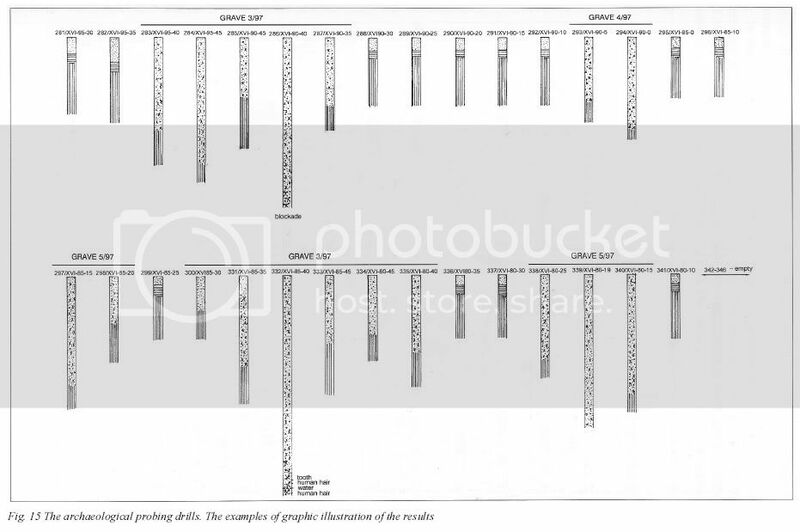 In bottom views the grave has a shape of trapezoid with the base of 12,50 and 11,00 m and the height of 17,00 m, with the depth reaching up to 4,80 m. The contents is of body remains of mixed character. There is a layer of bodies in wax-fat transformation with thickness of about 1,00 m in the bottom part; directly over it there is a layer of sand and lime. Above there are some layers of crematory remains and charcoal. The volume of the grave is estimated for about 920 m3. The grave is situated in the north-western corner of the presently enclosed area of the camp in the central-eastern part of ha IX. It was separated basing on 3 drills (No 1724-1726). In bottom view with the shape of a lengthened rectangle it reached the sizes of about 15,00 x 5,00 m, with the depth of over 4,00 m. The contents is mixed in structure; the bottom part contains bodies in wax-fat transformation, covered with lime at the depth of about 3,60 m. Above that appears the mixed structure of crematory ashes with charcoal. The estimated volume of the grave is about 400 m3. One of the biggest graves, in bottom view of a rectangular shape with the size of about 24,00 x 18,00 m. Situated in the north-central part of ha XV, basing on 16 deep drills (No 482-490, 494, 496-499, 501, 520); in some neighbourhood, much more shallow drills (with the ground bottom of about 1,50 m) crematory remains were reported. The grave was very deep (the drills in particular places were stopped at the depth of 4,25 to 5,20 m, because of bodies in wax-fat transformation and underground waters presence). One drill (No 483) at the depth of 4,40 m revealed the appearance of several cm layer of white sand mixed with rich lime. Over body layers there were some levels of crematory remains mixed with charcoal in turn with layers of sandy soil (20 cm). The edge parts of the pit are filled shallow, to the depth of about 1,50 m, probably because of getting some soil to make next layers between the bodies. That fact caused widening of the grave which was filled with next body remains. The estimated volume of the grave amounts about 2100 m3. Separated in the western part of ha XIV on the base of 11 deep drills (No 1030, 1035-1038, 1040-1044, 1046). The grave is situated directly to the south of the grave No 12 (the biggest of all separated here), and its western part exceeds slightly the present enclosure of the camp, reconstructed in the 60s. One can assume that the original borderline of the camp ran farther to the west. Shaped in a rectangle in bottom view, tile grave had the size of 26,00 x 11,00 m, reaching 5,00 m down in the deepest part. Within a reach of the grave 2 deep pits were reported, which made the archaeologists suppose that there had been previously 2 neighbouring graves (in the part, where the graves were connected the layers are considerably shallow to about 1,20 m). The drill No 1042 in its sponge part 40 cm thick layer of bodies in wax-fat transformation covered with a layer of lime was reported. Lime was also noticed in the drill No 1032, just above the ground bed. The grave contained layers of crematory remains and charcoal. The farthest western drill (No 1040) contained not only body ashes and charcoal but pieces of musty paper and wood, a piece of a nail and brick rubble. The estimated volume of the grave amounts about 1150 m3. Emphases in the text of the above quotes are mine. 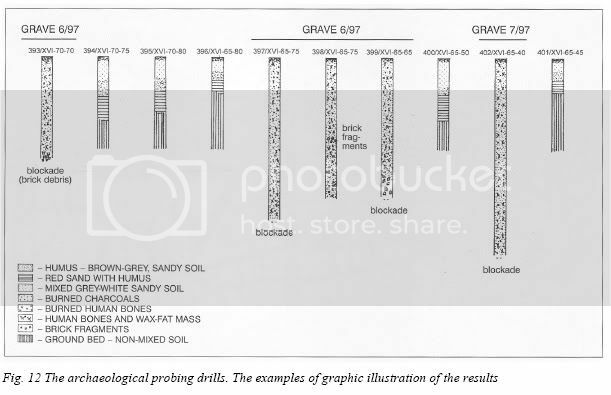 So corpse layers were found in 10 graves, of which Mattogno only mentions 4 more closely and acknowledges only 3, the ones in which the corpse layers are shown in Kola’s book in schematic representations of the drill samples. The arrogance with which Mattono swiftly sweeps aside 7 of the 10 graves described by Kola as containing corpse layers places another question mark on Mattogno’s suitability to make an objective analysis of Kola’s study. What is more, the fact that Mattogno expressly mentions Kola’s description of corpse layers in grave # 27, but omits the respective descriptions (see above quotes) in graves nos. 1, 4, 13, 25, 28 and 32, may be taken as an insinuation that Kola does not mention corpse layers in his descriptions of these graves. On top of those suggested by the examples pointed out in Part 1 and Part 2 of the present commentary, this would be another serious display of dishonesty on Mattogno’s part. Mattogno’s assumption that in the area of the huge grave # 10 there were "two small graves of 40 to 50 square meters with several layers of corpses at the bottom", on the other hand, may be attributed to the tendency for wishful thinking that is typical for "Revisionists". In order to understand how absurd this assumption is one must have in mind the above-quoted description of grave # 10. The Belzec camp administration, so Mattogno is apparently trying to tell his readers, is supposed to have dug more than 5 meters deep on an area of 24 x 18 = 432 square meters just to make "two small graves of 40 to 50 square meters", of which furthermore only the lower part was used to place corpses! If one generously assumes that the layers of corpses at the bottom of the "two small graves" assumed by Mattogno were 2 meters high, then out of the 2,100 cubic meters of grave volume estimated by Kola only two times 80 to 100 cubic meters, i.e. a total of 160 to 200 cubic meters or less than 10 % of the volume available, were used. Why should anyone in any situation, and especially the SS camp administration of Belzec, indulge in the luxury of wasting so much burial volume? The explanation that the rest of the grave volume could have served as ash deposit from the beginning would not hold water either, because the graves identified by Kola as serving for ash disposal only were much smaller and a single pit with a volume of 2,100 cubic meters, as we shall see in section 4.5 of this commentary, was enough to hold the ashes of all people killed and burned at Belzec according to the "official historical version". Could it be that Mattogno really didn’t think about this? • While Mattogno takes pleasure in making a fuss about O’Neill’s and Tregenza’s estimates regarding the number of unburned corpses still lying in the Belzec mass graves, it is rather irrelevant, for the question of whether the grave finds are compatible with the known facts of the mass murder at Belzec, whether there are "many thousands" (O’Neill) "at least 15,000" (Tregenza) or "at most several hundred" (Mattogno) unburned corpses still lying in the Belzec mass graves. For the placing of these corpses, generally at the bottom of the graves near the ground water table (which is also the cause for their state of wax-fat transformation), in connection with the pertinent eyewitness testimonies about the clearing of the mass graves for burning the corpses in the final months of the camp’s operation, allows for the conclusion that the corpses still lying in the mass graves are such that were overlooked when clearing the mass graves or left lying where they were because the depth of their position made removing them too cumbersome. 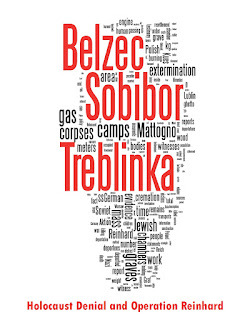 The question of the number of unburned corpses still lying in the mass graves is thus merely a question of the throroughness with which the Belzec SS carried out the clearing of the mass graves. Because of the limited time of the programme, as well as the vast (about 6 ha) area of the supposed camp, the probings were made at the cuts of 5 m long nets, assuring complete archaeological recognition, however, with a rather small accuracy in marking the ranges of the located objects. In particular situations where more detailed studies were necessary the drills were dense. 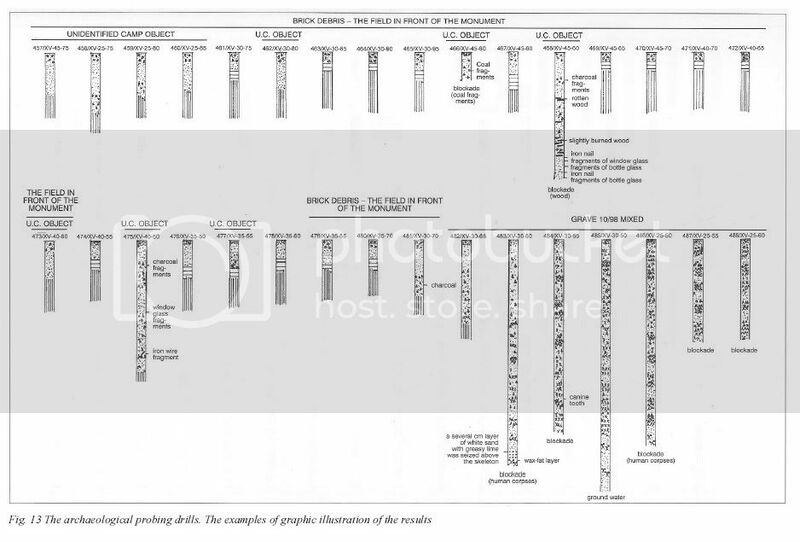 The basic probing drills were carried out by the means of manual drills in geomorphological and archaeological works with diameter of 2,5 inches (ca 65 mm), with the range of ground penetration to the depth of about 6-8 m, which proved quite sufficient in relict earth structures research. Using the type of drills in mass graves location had turned out to be useful in archaeological-exhumation works in cemeteries of Polish officers murdered by NKWD in spring 1940, within the works of so called "Katyn crime"14 .